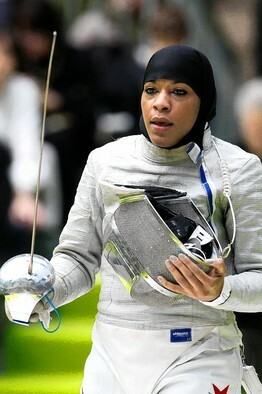 "Fencer With Headscarf Is a Cut Above the Rest"
"I'd love for other minority women and religious minorities [in the U.S.] to believe they can excel in something outside the norm—not just sports, anything where they're breaking the barrier," she said, "and not be deterred by what the image is just because they fall outside that box." If this isn't just the perfect quote for inspiration, motivation and dedication to attain any dream you currently wish to attain, then I don't know what is. As I sit and study for my first CPA exam coming up on Friday morning Insha'Allah (God willing), I take a break to check my email and read this article my brother emailed me. If it wasn't the most perfect timing in the world, I don't know what else could have motivated me to continue studying into the wee hours of the night. Every person has their own struggle, their own goals, their own dreams, and each and every person also has downtime where they are feeling defeated, discouraged or unsure. This article is a great reminder to keep moving forward to attain your goals. I'll keep this short, so I can get back to studying, but please take the time to read this article because it truly is inspirational to all women.